The SasQuatch (SQ) 460 Driver. The SQ 460 features a distinctive yellow sole design and club head design with what company officials call the "ideal ratio" between the width of the club face and the depth of the club head. Very straight and forgiving. Love it or hate it looks at the time, the head has aged well . . . at least I like it. Not the deepest face by modern standards, but not too shallow, either. Looks good at address. Mishits still try to fly straight without too much loss of distance. Sounds better than the later, square-headed SQ's, which are so loud. Would probably appeal more to players above a 10 handicap. Better players into shot-shaping find the face a bit shallow for their liking. Hence, the follow-on model, the SQ Tour. Bought a 10.5 regular flex shaft for $50 at a used dealer. I have a high enough swing speed that regular flex is probably not enough for me but for $50 I figured why not. Well I couldn’t be happier with the club. Since I got it I went from hitting 3 wood or 4 iron off of every tee to being the longest hitter of the group..... by a significant margin. Had never been able to hit a driver and this club changed my thoughts on driver and my potential. I’ve gone back to the championship or blue tees in the 2 years since I got this club and have broken 80 from there. I’ve shot my 1st 9 under par and posted my 1st round of even. Granted I’ve upgraded my irons and gotten better as a putter but you can’t say that the distance off the tee hasn’t played a role as well. I play a Maxfli Power Max at home, which I think is the best driver you can get for under $100 (I've hit many different drivers at shops, ranges and borrowed friends' drivers on the course). WHile traveling on business I rented a set of Nike Clubs at the course. The Nike Slingshot irons shot as well as my own Dunlop irons, but the Nike SQ Dymo hit a little further and a little straighter. I average hitting about 50% of fairways with my Maxfli driver...averaging about 210 - 230 yds off the tee. Using the Nike SQ Dymo 460cc, in two days I hit 19 out of 30 fairways and averaged about 220 - 245 in distance. 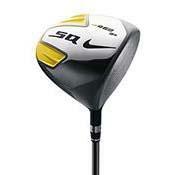 For $100-125, Nike SQ Dymo 460cc is a great value in a driver. I love this driver. All the good reviews written above are so true. I was seeking a forgiving driver yet one that I could grow in to and eventually hit fades and draws, etc... I was planning on getting the Calloway Diablo or Ping because of their reviews on Golf Digest until I came across this driver at Sports Authority for only $150 and advertised to have both control and forgiveness. I bought it, went to the range and instantly I must have hit my first 15 shots perfectly straight over 200 yds. Callaway Big Bertha, Diablo, numerous demos. I was playing with this guy who just bought a Diablo and making slices and pulls all day. I suggested he try out my new Sumo. He hit a nice draw 20 yds farther than any of his Diablo T's all day. Nike, I'm yours. I'd long ago given up the hope of hitting a driver from the tee box. In fact, I'd been using a 3-wood with an extended shaft off the tee for years to take advantage of the increased loft. Even with this approach I was hit-or-miss from the tee; if I managed to hit the sweet spot then I was straight but if I missed even in the slightest, I was often in the trees. The 460cc driver wave came and many of my friends spoke highly of the increased forgiveness of the larger club face but I feared giving up the extra loft. The Nike lucky 13 and the sweet 16 then seemed like potential solutions to my inconsistency. I went with the 13 over the 16 because I thought the increase in required tee height for the larger club face combined with the 13 loft would more closely match the launch angle of my 3-wood. After playing a round all I can say is wow! With no range time and only a few practice swings on the first tee, I drove straighter than in any round I'd ever played in my whole life. Even miss-hits stayed in the fairway - not a single drive even went into the ruff yet alone the trees. On top of that I out drove my regular playing partners who have always had more distance off the tee. Was this a one-round fluke or is this club perfectly suited to my mediocre skills-set? I sure hope its not a fluke and that my future rounds will be as enjoyable as my last. I just got this club this year and last year I was using a Golden Bear 460 10 degree and could only hit it 260 yards then I got The SQ 460 now i am hitting the bal 290+, I really love this club. I have tried the Nike SQ square driver(Nike SQ SUMO 5900)and it got me about 4 to 5 yards further than my old driver and alot straighter and higher.